What do you think about when you come across a squirrel? Cute, furry, indecisive (like when crossing the road), pesky? Well nuts to you too! Squirrel are actually quite cleaver and adaptive. Just when my husband Bob and I started feeding the birds in a small wooded area in front of where we park our cars, we started noticing Eastern Gray Squirrels (Sciurus carolinensis) joining in to on the bird seed and peanuts meant for the birds. Many people who feed the birds are always looking for innovative ways to keep squirrels off their feeders. This past summer Bob and I decided to put a bird feeder on our apartment terrace, and sprinkled peanuts out for the Blue Jays. Residing in a fourth floor apartment, we figured our terrace feeder was safe from squirrels. We were so Wrong. Of course when I spotted the Eastern Gray Squirrel on our terrace, the first thing I did was grab my camera, and finding this quite humorous I posted photos on facebook. A common question I received from my friends is how do those darn squirrels get up on your terrace? 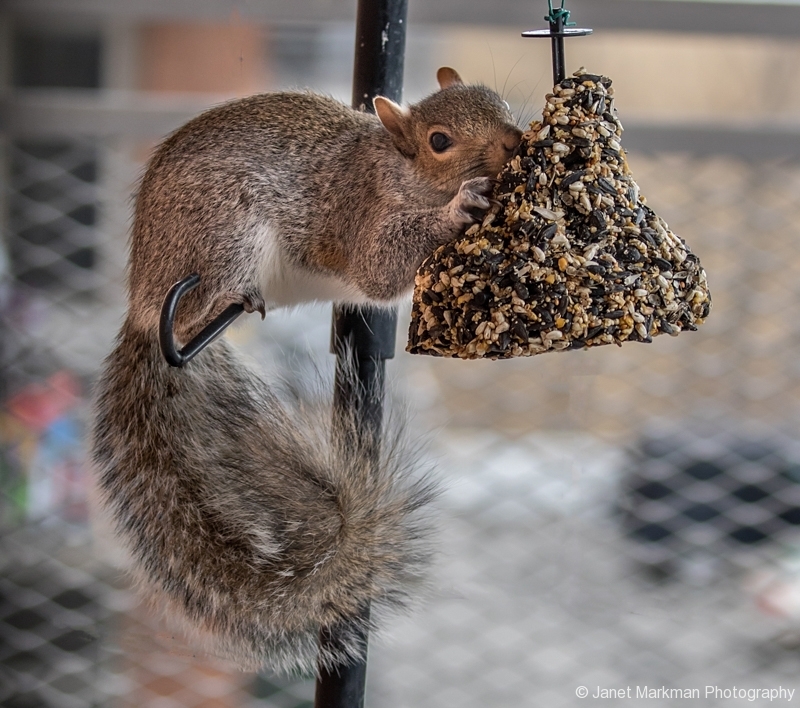 The Eastern Gray Squirrel belongs to the subfamily – tree Squirrels, and are probably America’s most acrobatic mammal, having the ability to climb up concrete, stucco and brick walls just as easily as they climb up trees. A squirrel can climb any tree or porous surface. You may wonder how do they do this? Tree squirrels have two very important adaptions. First they can rotate their ankles one hundred and eighty degrees enabling them to point their feet backwards. The second adaptation is their razor sharp claws, with needle like nails, allowing them to climb upwards and downwards, or even cling to a tree limb or tree trunk using only his hind legs. These adaptions enable a squirrel to move very rapidly in any direction, even go down a tree head first and hang to on a tree by using only its back two feet. In contrast a cat, like other climbing mammals whose back ankles do not rotate, must make its descent tail first, which can be a slow even dangerous process. How many cats get “stuck’ in trees too scared to come down? The Eastern Gray Squirrel’s claws also allows them to grip as they jump from tree to tree. They are capable of jumping up to six feet vertically and eight feet horizontally. When watching squirrels you can’t help but notice its most distinctive physical characteristic -their large bushy tail. Their generic name, Sciurus, is derived from two Greek words, skia, meaning shadow, and oura, meaning tail. Their tail is a handy tool that can be used for balance when scurrying around from tree to tree, a sun shade to keep cool, an umbrella to keep dry, a blanket to keep warm, and also is a communication tool. Bob and I feed the squirrels peanuts and almonds, which they have no trouble opening. In the wild they eat all sorts of nuts and seeds. How are they capable of this? Gray squirrels have a bite force of around 7,000 pounds per square inch (psi). For comparison, most humans have a bite force around 500 psi. 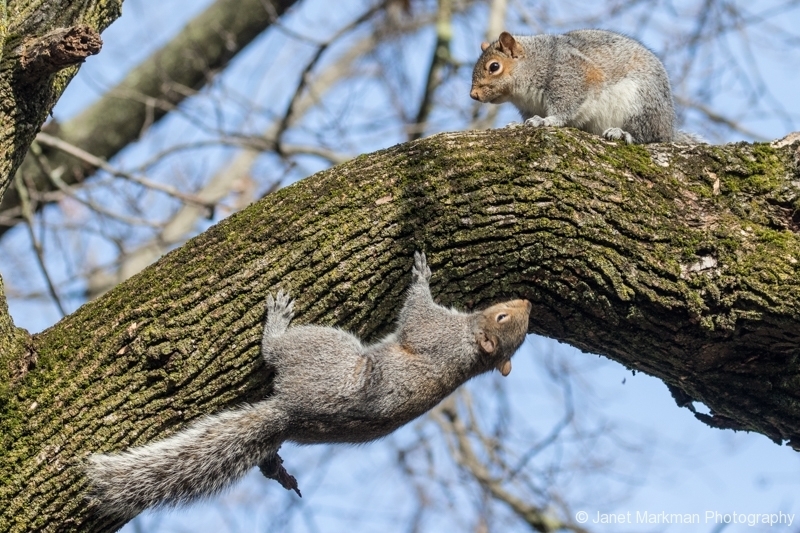 The Eastern Gray Squirrels nests in trees much like birds do. 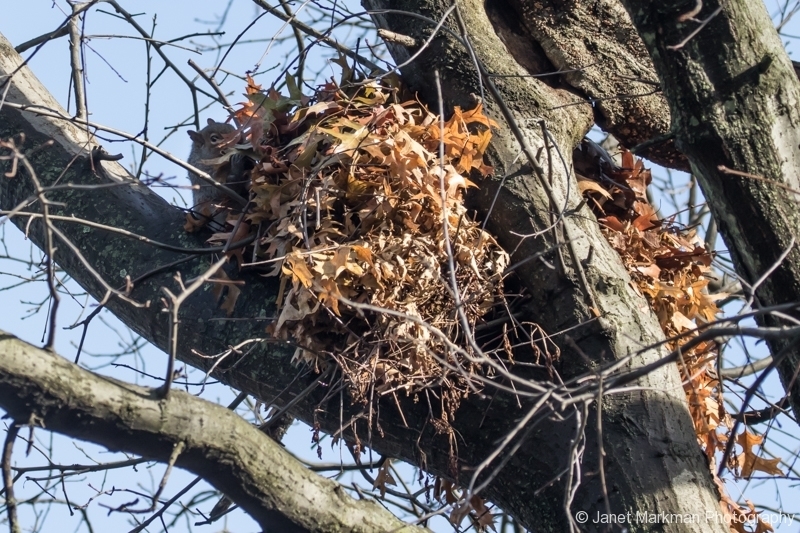 Their nest is called a Drey or leaf nest, which is built in the fork of a tree and is made of dry twigs and leaves. The inside is lined with, leaves, moss, grass tree bark and other available materials. During winter the Eastern Gray squirrel does not hibernate, but will lie up in the drey in very cold weather, using it as a den, coming out now and then to search out hidden stores of nuts they buried in the ground in autumn. Gray squirrels can be seen out in the winter months as long as the temperatures are not too cold (not below 30 degrees F). 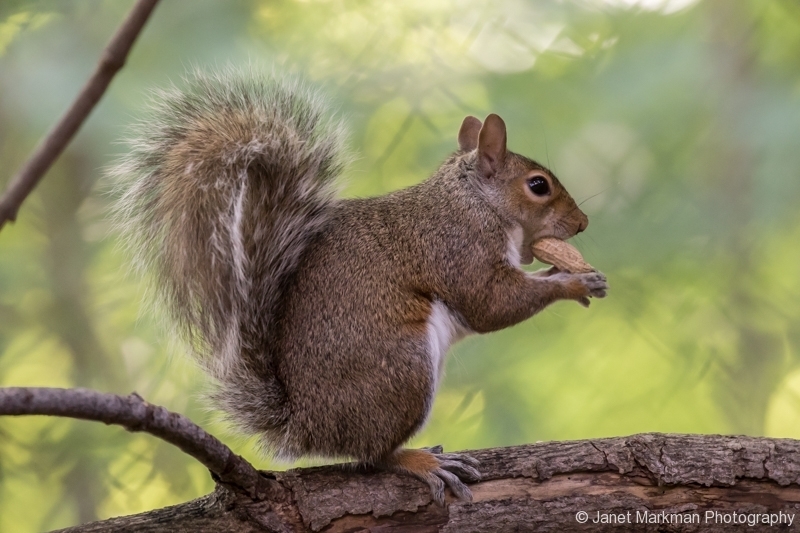 Eastern Gray Squirrels are scatter-hoarders who can make up to several thousand caches in the season to sustain themselves throughout the winter. Squirrels use their spatial memory, as well as sense of smell, to locate their caches long after they have been buried. Of course not all the nuts and seeds stashed get eaten, so squirrels play a key role in the regeneration of forests. Squirrels will also use abandoned woodpecker holes for their nests / dens. 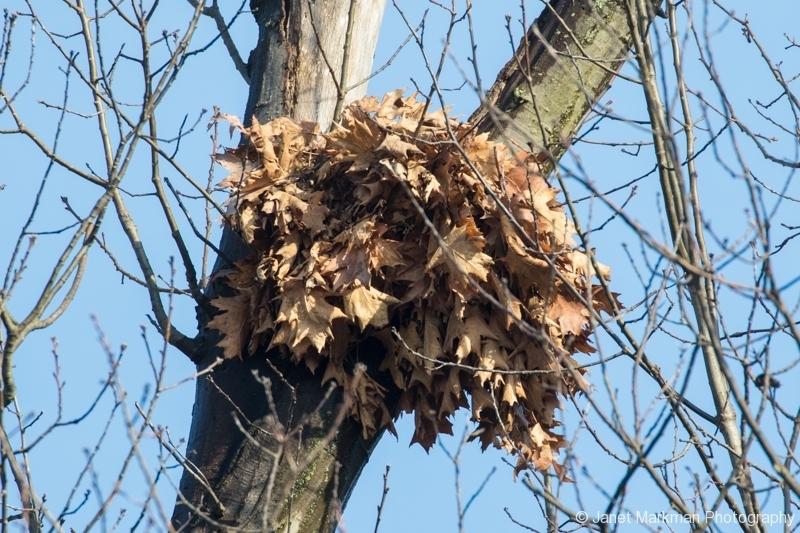 So when you are walking in your favorite park and notice a nest made of leaves nestled in the fork of a tree – that was probably made by a squirrel and not a bird. I find watching squirrels to be quite entertaining. 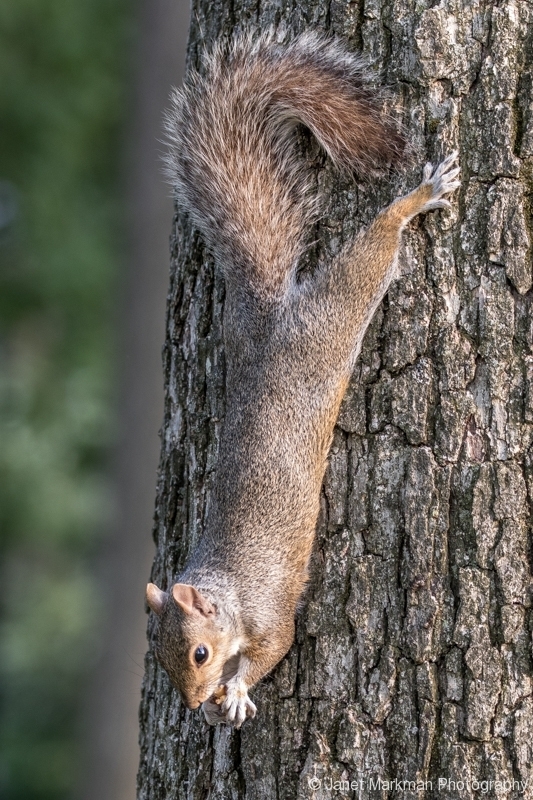 When visiting your local park take the time to observe a squirrel’s acrobatics. You will surely be entertained. And be sure to take a pair of binoculars with you and observe how their ankles point backwards when they are descending a tree. Feel free to leave a comment about your experiences with these arboreal acrobats. This entry was posted in Squirrels. I never knew even a tenth of what you have taught me about squirrels! The pictures are terrific and really demonstrate their agility. Thanks so much for posting this! Bev, Next time you see the squirrels, take a few minutes to watch them, you surely will be entertained by them. Amazing facts about these cute little creatures…Great shots, too…almost looks like they are posing for the camera!! Unfortunately we had a few families of them who had settled in our attic when we moved into our home (even one family of flying squirrels) and finally found an animal company that could humanely remove them. We sealed up the holes and they have not returned …now we watch them in our trees and yard where they belong! Ann -Thanks for humanely removing them! Have fun watching their antics in your trees.